Nitewalkerpreamp.com is dedicated to customer satisfaction. We offer a five year warranty. Simply email us to receive instructions on returning your purchase. Should there be a material or workmanship defect during the Warranty Period, the end-user purchaser shall contact Newbasstone, Inc to arrange for the return of the item. The end-user purchaser will be responsible for all efforts and costs incurred in transporting/mailing/shipping/insuring the defective item(s) to and from the manufacturer. A copy of the dated receipt/invoice should be enclosed in the return package. Detailed Warranty information may be found at the bottom of the Requirements page. Shipping to and from Nitewalkerpreamp.com is at the customer’s expense and varies according to weight, size, shipping type and location. If a defect in one of the Nitewalker Bass Guitar Tube Preamps is found to be the fault of Newbasstone, Inc. these shipping fees will be refunded to the customer. The shipping rate for each preamp shipped to U.S. destinations is $23.80 and includes insurance. This is USPS Flat Rate Shipping. International orders will be dealt with individually. Please email if you would like to order from outside of the U.S.
A Proven Method to Create Bass Tone Equal to Recording Quality in Real Time - Live and on Stage! How frustrating is it that every time you plug your bass guitar in and play you aren’t able to find the tone that you were able to create for your recordings in the studio? With this newly patented bass tone electronic circuit you will be able to do just that! The basis for this circuit lies in 1940s technology combined with 1960s and later technology capacitors. 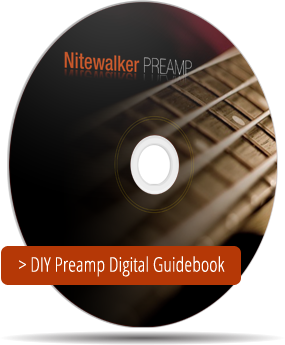 It would be possible to build a preamp of exactly the same make-up as a Nitewalker Bass Guitar Tube Preamp for a total cost, including the cost of this ebook, of around $35.00. With the investment of about one week of work in the basement or home shop this guide will provide you with the ability to sound live just the same as you do on your recordings. Parts can be scrounged and gathered from flea markets, eBay, ham fests, etc., or bought new. Prior knowledge of building electronic devices is not a requirement. This guide will teach you everything! This preamp contains antique electronic components combined with modern electronic components, which means they can't be easily mass produced. The author of the Nitewalker Preamp Guide and inventor of this circuit is a 1979 Berklee College of Music graduate. Other bass preamps offer many tone controls and adjustments, but there always seems to be something lacking. You still sound better on your CD than you do live on stage or at rehearsal. This circuit will make it possible to give you studio sound everywhere you perform! A group or organization need not want for a more powerful and musical bass guitarist for those special occasions. A simple homemade bass preamp of this design, costing little more than the time it takes to make it, can be provided, which will bring all the joy one of the Nitewalker Bass Guitar Tube Preamp prototypes will. After all, "Fun not bought with money" is an excellent recreation maxim, and it applies to small or large venue shows. This CD will provide a basic, rudimentary schematic, so that anyone can build a working, good sounding bass preamp. Connecting a safety ground in the power supply causes many difficulties, therefore in the interest of creating a good learning experience this topic is not included. This type of power supply, which is described in this CD, was used in early tube amplifiers. The Nitewalker Bass Guitar Tube Preamp itself uses a more complicated power supply with a safety ground and other intrinsic safety features. Free shipping of CD to U.S. customers! Digital delivery for customers from other countries or for faster service via email! Use the secure checkout to order now! Submit photos of your build for posting on this website! Copyright © 2019 Nitewalker PREAMP. All Rights Reserved.